This supper is easy to prepare and cook and is packed with seasonal flavour. Try it on its own or as a tasty accompaniment to a roast. 1. Preheat the oven to 200°C, gas mark 6. Peel the squash, cut in half lengthways and remove the seeds. Cut the flesh into chunks and place in a large roasting tin. 2. Cut the peppers in half, remove the seeds and stalks and cut into chunky pieces. Add them to the roasting tin. Halve the onions, then cut into small wedges and place in the tin. Drizzle the vegetables with olive oil to coat well and season with freshly ground black pepper. Roast in the oven for 45 minutes or until slightly charred at the edges. 3. Remove the vegetables from the oven and sprinkle with the vinegar. 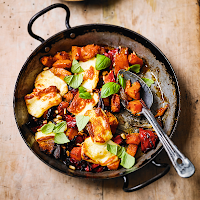 Scatter the halloumi over the top and cook for a further 25 minutes or until the halloumi is golden. 4. Scatter the pine nuts and basil leaves over the top and serve piping hot, with a green salad on the side. These vegetables generate a lot of steam, so use the biggest roasting tin you have to give them plenty of space. Alternatively, use 2 smaller tins and swap shelf positions halfway through cooking.